rejection of what he said is the faulty home which the Ministry sold him. Thirty-five year old Gilbert Campbell protested during the mid afternoon hours with a cardboard which read ‘stop robbing poor people, fix my house now.’ The man said he has been occupying his Lot 1127 Eccles home for about two years now. The home was part of the Housing Ministry’s turnkey programme to provide affordable homes to citizens. The man purchased the two bedroom V-roof flat houses costing $4.9M. He said that about 18 months after moving into the property, it started to deteriorate. The man claimed that most of the columns in the house have cracked tremendously, while a faulty wire provides electrical problems. Campbell claimed also that whenever his family uses the washroom, the toilet usually leaks and the water runs out of the washroom into the living quarters. The father said that the house came with no ceiling. Campbell said that he expressed concern to the Ministry almost three months ago, but to date he received no reply. He said the Ministry asked him to take photographs of the damage and submit them. Campbell said that he hired a photographer and did as the housing personnel asked but still there was no reply. The father said that he has become very frustrated because he has to “work hard” to repay the loan which he took from the New Building Society (NBS) and if left undone, he would also have to repair the property. Campbell is even more upset, he said, because he was more or less “bullied” into taking the two bedroom property. The taxi driver said that his wife, a trained teacher, had applied to the Ministry for land since 2006. When they were making checks about getting the land, Campbell said they were told that there was no land available anywhere and they had to take the turnkey home. The man said that there was so much runaround about getting the land that he and his wife just decided to take the home to place their children. However, when taking the home from the Ministry, applicants have to sign contracts, one of which says that after one year the Ministry is no longer responsible for any issues that might arise with the property. Campbell said it was about six months after the year expired that he would have noticed the faults. When asked if he had read the terms of the contract, Campbell said he really did not pay much attention to that since he did not want the property in the first place. He stated that despite the terms, it is unreasonable that after such a short time the family should already be experiencing such significant damage. He said that despite the contract he is consulting a lawyer to ascertain what his options are. “I am not rich, I just want to take care of my family and this here is extra stress.” Campbell said he is not thinking about giving up the home since he would have already invested money to build up the yard and construct a fence among other things. 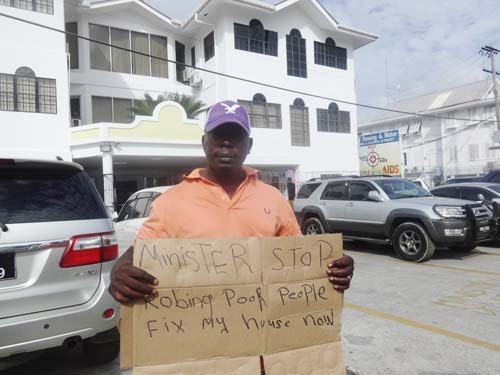 Within an hour of picketing the Ministry, Campbell said that he received a call from the Housing Ministry for a meeting with the project’s directors and the Permanent Secretary. According to him, the officials promised to have an engineer visit his home today and a report will be returned to them. They promised to take further action, Campbell related.